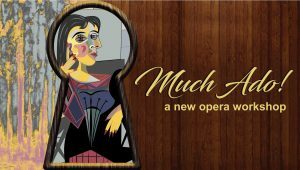 “Much Ado!” is a new opera by James Garner with a libretto adapted by Patrick Hansen from Shakespeare’s comedy, Much Ado About Nothing. This two act opera is still a work in progress and has been workshopped at the Guildhall School of Music and Drama and McGill University. The world premiere is planned for 2021 by Opera McGill in Montreal. Librettists, Composers and Performers spend years transforming theatrical ideas and music into an opera production. We are giving you the rare opportunity to observe an opera in progress. Be a part of the process of workshopping a new opera and share your feedback with the composer & librettist.